God has given us potential we could not even imagine. One just needs to Move forward in truth with Divine faith and when you do, you will see the insurmountable barriers yield and the ominous threats will just fade away. You will see that despite all the “evidence” to the contrary, we have it within our power to bring the redemption AS MASHIACH WAS BORN ON THE 9TH OF AV.. The sky is not the limit. All depends on God as He is the one who gives all abilities. And there is nothing He cannot not do. It is we by separation from Him, who limit ourselves greatly. MASHIACH WAS BORN ON THE 9TH OF AV, A NEW HIGHER CONCOUSNESS ENTERED THE WORLD now its up to us to actualize it ! Hopefully we can develop this birth of mashiach to full capacity and not snuff Him with pride parades and other anti Hashem activities of the “erev rav”. Its written in the Zohar 60 is awakening of the first masiach (Messiah). In 6 more is the awakening of the 2nd. This leaves 6 more years until 72 (maybe its 72 years since the birth of the state of Isreal). At that time the redemption will take place. The year 5666 was 2/3 of the way through the 6th millennium, from that point onward Mashiach can be coming at any time. The Eclipse will be visible this Friday from 10:30 PM Friday in Jerusalem, Israel. the maximum eclipse, where “[the] moon is closest to the center of the shadow [cast by the Earth]” begins at 11:21 PM, Jerusalem, Israel, the totality lasting for an hour and 43 minutes, it won’t be visible in north America. THIS BLOOD MOON AFTER THE BIRHT OF MASHIACH COMING CLOSE TO THE POSSIBLE LAST TIMES FOR REDEMPTION IS A SIGN FOR US JEWISH PEOPLE HERE IN ISRAEL AND MAY IT BE A GOOD SIGN ! NASA data shows that there was a tetrad of blood moons between 1949 and 1950, a key time for Israel’s modern-day birth. Another tetrad happened between 1967 and 1968, a period which saw the Six-Day War — a moment of “triumph” when Jerusalem was reunified and became the eternal capital of the Jewish people once again. There was a string of four “blood moons” in the year 5775, and one of them shined over the Passover seder. Whenever this happened in the past, enormous events took place in Jewish history. Since then we have see the grown of Horrible evil on the left and the Rise of President Trump who stands by Israel and is making “tikun” of Edom. One needs to decide that no matter what the obstacle their resolve will not be shaken. This is the kind of dedication that brings one to the ultimate freedom of God and the Torah. It needs to be one’s life, that’s the only reason one would be willing to give their life for it IT IS A LOVE AS THIS THAT WILL BRING REDEMPTION !
. The “Mishkan” (Tabernacle) was completed during the month of Kislev its dedication was in Nissan. The construction of the first “Beit HaMikdash” (Temple) by King Solomon began in the month of Iyar, and was completed in the month of Cheshvan. The dedication of the Temple was nearly a year after the end of its construction in the month of Tishrei. The Bnei Yissaschar teaches that the future dedication of the third Temple will take place during Cheshvan. For the third time in less than a year on this coming Passover of 2015, the moon will dip into Earth’s shadow, turning its bright white globe a coppery red in a matter of minutes. The total phase of the lunar eclipse will only last about 5 minutes, making it the shortest lunar eclipse of the century. The action begins at 3:16 a.m. PST on the morning of April 4 when the edge of the moon first enters the amber core of Earth’s shadow. For the next hour and 45 minutes, Earth’s shadow will move across the lunar disk, ultimately covering the entire moon at 4:58 a.m. PST. Some total eclipses last for more than an hour, in this case, totality spans just 4 minutes and 43 seconds since the moon will be skimming the outskirts of the Earth’s shadow, rather than passing centrally through it. The pattern of eclipses on Jewish Holy Days correspond with significant events in history. EVERY PURIM HAD AN ECLIPSE!!! THAT DID NOT OCCUR ON PURIM OCCURRED ON PASSOVER INSTEAD. 1904 March 02 Penumbral Purim 1: The 14th of Adar. 1904 March 31 Penumbral Passover: The 14th of Nissan. On Sept. 24, the 1st day of Tabernacles, there was another Penumbral eclipse (The 1st & last of the 7 feasts). 1923 March 03 Partial Purim 2 (Eve): Observed on the 16th of Adar as the day of rejoicing, because the 15th was the Sabbath day in 1923. 1932 March 22 Partial Purim 1: The 14th of Adar day of rejoicing. 1959 March 24 Partial Purim 1: The 14th of Adar. 1961 March 02 Partial Purim 1: The 14th of Adar. 1978 March 24 Total (South) Purim 2: The 15th of Adar. 1979 March 13 Partial Purim 1: The 14th of Adar. 1980 March 01 Penumbral Purim 1 (Eve): The 13th of Adar when the Jews were fighting for their lives. 1988 March 03 Total Penumbral Purim 1: The 14th of Adar. 1997 March 24 Partial Purim 2: The 15th of Adar. 1998 March 13 Penumbral Purim 1: The 14th of Adar. captured Jerusalem in 1967. We see a similar phenomenon occurring on Purim. 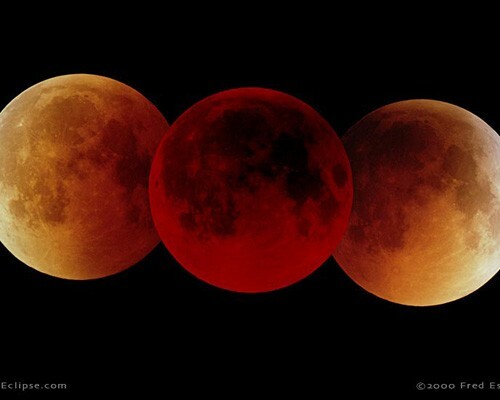 Blood Red Moons will occur like this ..
Tabernacles 5776 (Sept 28th 2015). Sunday’s early morning event – an annular solar eclipse that changes into a total solar eclipse – will be visible on the eastern coast of North America, although those living in Africa will experience it best. Sunday’s eclipse (March 20th 2015) will become total, completely blocking out the sun and allowing those in its shadow to see stars during the day time. It is this shift from annular to total along its path that makes this a “hybrid” eclipse. Three Jewish holidays always happen when there is a full moon: Purim, Passover, and Sukkot (Feast of Tabernacles). Therefore, it is not strange to have an eclipse on one of those holidays, and because Passover and Sukkot are exactly six months apart, when Passover gets an eclipse, Sukkot will probably get one, too. Of the 230 eclipses that occurred in the twentieth century, 37 were on Jewish holidays. However, it is very rare for both eclipses to fall on Jewish holidays for two years in a row, and for all of them to be total not Eclipses. “Around eight months before the Temple was destroyed we find on 10/18/69 there was a partial lunar eclipse on the Feast of Sukkot. A total solar eclipse followed this on Nisan 1-3/30/70, the beginning of the religious year. Two weeks later there was a penumbral lunar eclipse on Passover on 4/14/70. An annular solar eclipse followed this on Rosh Hashanah on 9/23/70. In the blood moons of 1493 and 1494, the Jews were expelled from Spain. 1949-1950: This has been linked to modern Israel becoming independent in 1948. However, the first blood moon comes eleven months AFTER independence, and even the 1948 war was over by then. The blood moons in 1949 and 1950 came right after the nation of Israel was born, giving the Jews a homeland for the first time in thousands of years. And in 1967 and 1968 it was linked to the Six-Day War. 1967-1968: Well, maybe. The Six Day War happened between the first and second blood moons, and Israel took East Jerusalem, reuniting the city. This would be totally unbelievable, if it wasn’t verified by the NASA. Only one of these 4 lunar eclipses will be visible from Israel. According to NASA data, there was a tetrad from 1493 to 1494 (there were three preceding tetrads that century as well, but they did not fall on Jewish holidays). And that’s not the only series of blood moons linked to Israel, as NASA data shows that yet another tetrad unfolded between 1949 and 1950, a key time for Israel’s modern-day manifestation. NASA data also shows that four blood moons emerged between the years 1909-1910, 1927-1928 and 1985-1986, but these also did not fall on the Jewish holidays. NASA says the current tetrad of blood moons that started in April 2014 will last through Sept. 28, 2015. The last tetrad to occur happened between 2003 and 2004, though it did not fall on Jewish holidays. NASA data does appear to show six others will happen this century, but none appear to have all four blood moons fall on both Passover and Sukkot as they do in 2014 and 2015. All four can be seen from the western hemisphere. The redemption of Yisrael from Egypt occurred in the month of Nisan, when the Mars is dominant.